Cleveland 2030 District: In 2012, The City of Cleveland joined the district to create a coalition of building owners, service professionals and community stakeholders working together to rapidly transform the built environment of the city through large-scale reductions in energy use, water use and GHG emissions. Cleveland – Cuyahoga County Food Policy Coalition: The City of Cleveland participates in the Coalition to improve food access in urban neighborhoods and stimulate the overall local food system in Northeast Ohio. Climate Mayors - Mayor Frank G. Jackson joined a group of more than 300 mayors to adopt, honor, and uphold the commitments to the goals enshrined in the Paris Climate Agreement. Compact of Mayors: The Compact of Mayors is the world’s largest coalition of city leaders addressing climate change by pledging to reduce their greenhouse gas emissions, tracking their progress and preparing for the impacts of climate change. The City of Cleveland joined the Compact in 2015 leading up to the climate conference in Paris. Corporate Roundtable: Convened with the Center for Sustainable Business Practices at Cleveland State University's Monte Ahuja College of Business and the Corporate Sustainability Network, this group of business leaders meets monthly for peer learning about best practices and innovation in corporate and community sustainability. Earth Day Coalition: The Earth Day Coalition aligns the theme of their annual EarthFest with the Celebration Year of Sustainable Cleveland 2019. For the 2012 event, the theme was local food. Fowler Center for Business as an Agent of World Benefit: The Fowler Center at Case’s Weatherhead School of Management leverages interdisciplinary scholarship and practices to help leaders capitalize on new profitable business opportunities to solve the world’s growing social and environmental problems. The Fowler Center voluntarily facilitates the Annual Summits for Sustainable Cleveland 2019 and advises the initiative on an ongoing basis. Great Lakes Energy Development Task Force: The Office of Sustainability works with this task force to explore options for advanced and renewable energy in Northeast Ohio. In 2009, the Task Force created the Lake Erie Energy Development Corporation (LEEDCo) to build wind turbines in Lake Erie and help stimulate an entire offshore freshwater wind industry. Great Lakes Restoration Initiative: As the largest investment in the Great Lakes in two decades, this initiative seeks to clean up toxics, combat invasive species, promote nearshore health by protecting watersheds from polluted run-off and restoring wetlands and other habitats. GreenCityBlueLake Institute: GCBL is making the Cleveland Museum of Natural History a hub of sustainability information and activity — a place where the public comes to create new visions of a sustainable future. The City and GCBL collaborate on a number of programs and projects, including Sustainable Cleveland 2019. Green Energy Ohio: Green Energy Ohio is dedicated to accelerate the development and growth of clean energy in Ohio. Healthy Cleveland Initiative: The Healthy Cleveland Initiative, launched in the spring of 2011, aims to reduce health disparities in the city of Cleveland and improve quality of life for every resident in Cleveland. Lake Erie Allegheny Partnership for Biodiversity: LEAP is a consortium of organizations operating within a wide spectrum of conservation missions with regard to the natural world. 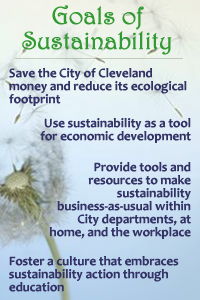 Local Governments for Sustainability: In 2007, the City of Cleveland joined ICLEI – Local Governments for Sustainability to help reduce its carbon footprint. Northeast Ohio Advanced Energy District: The City of Cleveland and the municipalities of the First Suburbs Development Council created Ohio’s first energy special improvement district, a not-for-profit entity. Northeast Ohio Sustainable Communities Consortium: Established in January 2011, the NEOSCC aims to create a vibrant and resilient Northeast Ohio that increases our quality of life, connects our communities, welcomes diversity, restores and protects our natural resources, and creates a competitive economic framework for the vitality of our region. Sustainable Purchasing Leadership Council: SPLC is a community of professionals dedicated to using the power of sustainable procurement to enhance local and global quality of life. Urban Sustainability Director’s Network: In 2009, the City of Cleveland became a founding partner of the Urban Sustainability Director’s Network, a private professional network of municipal government sustainability professionals. The network includes over 100 cities and counties in the U.S. and Canada, representing approximately 50 million citizens. United Nations Global Compact: In 2008, Mayor Jackson signed the UN Global Compact, making Cleveland the second U.S. city to do so. Three of the compact’s principles concern the environment. By becoming part of this strategic policy initiative, the City encourages the development and diffusion of environmentally-friendly technologies. U.S. Mayors Climate Protection Agreement: In 2006, Mayor Frank G. Jackson signed the U.S. Mayor’s Climate Protection Agreement. This signature acknowledges that the City of Cleveland takes climate change seriously and will make efforts to reduce the City’s overall carbon footprint. U.S. Green Building Council: The City of Cleveland has been a member of the U.S. Green Building Council since 2006. The City is also a member of the Northeast Ohio Chapter of the USGBC. The USGBC’s community of leaders is working to make green, healthy buildings available to everyone within a generation.